Has a wheel just come off Britain's participation in the biggest European space mission of the next decade? Funding for UK-led experiments on the ExoMars rover and lander is to be cut by 25% in their key development phase. The one-billion-euro mission to search for life on the Red Planet has always been touted as the one project that plays to all of Britain's strengths. Now, unless researchers can find extra funds or reduce costs, some of them are certain to miss the flagship mission. Professor Steve Schwartz, from Imperial College London, is working on a magnetometer instrument for ExoMars. He told BBC News: "If this sticks, it means for sure that some instruments won't fly; that some groups either won't participate or they won't participate in as many instruments as they planned to. "And that means there will be science that either ExoMars won't do or the UK will lose to some international competitor." ExoMars is part of the European Space Agency's (Esa) Aurora space exploration programme. The robotic mission is being prepared by teams across Europe, with help from the United States, Canada and Russia. It is set to leave Earth in 2013 and land on the Red Planet in 2014. 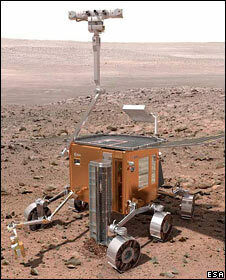 The cut-back does not affect the industrial project to construct the rover vehicle and its various sub-systems - for which UK companies continue to have major inputs. Rather, it impacts just Britain's contribution to the science ExoMars intends to pursue once it gets down onto the surface of the Red Planet. British university academics are developing a host of instruments that will search for the presence of microbes and also investigate Mars' geology and environment. As presently configured, the mission would see UK scientists assume several of the lead, or Principal Investigator, positions on the mission. These positions are now threatened because of a decision to rein back development money. The problem stems from the budget squeeze experienced by the funding agency which oversees UK astronomy and physics - the Science and Technology Facilities Council (STFC). It has sought to claw back £80m of savings to balance its 2009-11 budget - and ExoMars lost out in a review process that was held to find the highest priority science endeavours. Although the strategic importance of ExoMars was recognised in the review, it was still recommended there be "a reduction of 25% to the planned spending line for ExoMars". 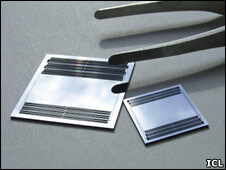 STFC rubber-stamped the cut "after receiving no strong arguments against this from the consultation process". "Well, that's not actually true because I put at least one strong argument in," said Dr Mark Sims, from Leicester University, who is developing the Life Marker Chip (LMC) instrument for ExoMars. "I didn't think it was supposed to be a 'who shouts loudest gets the money' process... but in hindsight, maybe we should have put more responses into the Programmatic Review." 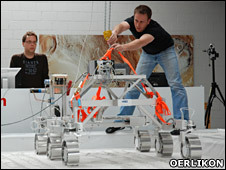 Professor Schwartz believes the reviewers may have been scared off by the cost of ExoMars, and could have felt the relative science value was therefore not as great as some other projects. One reason ExoMars is so expensive is because it will look for life. This means the spacecraft and all its instruments must be prepared so that no Earth contamination is carried to Mars that might fool the detectors into thinking, falsely, they had found Martian organisms. "By its nature, this is expensive science," said Professor Schwartz. "Also, it looks expensive because we are right at that phase when everything is being defined and everyone is getting ready to build." In truth, the whole ExoMars project is still some distance from being finalised. It is not apparent yet precisely how much volume and mass will be available for instruments, both on the rover vehicle itself and in its Humboldt landing tray, a payload of scientific instruments. Also, ExoMars' final industrial price - the money Europe's aerospace companies will expect to be paid to construct and deliver the mission to Mars' surface - is still in negotiation. Tiny UK-built seismometers would listen for "Marsquakes"
What is abundantly clear is that this flagship venture is going to cost close to double what space ministers first approved in 2005; and that is likely to prove problematic for many Esa member states when the next ministerial meeting is held in November. For the UK, some hard decisions will have to be made. At the moment, its financial contribution (101m euros) to ExoMars is second only to the Italians. Britain will have to decide whether it wants to maintain that leading position and pick up the rising costs at its current investment rate (17%), or step back from the planetary venture that was supposed to have met all UK objectives. Dr Sims said UK scientists were about to start an assessment process which would try to refine the exact costs of developing their instruments. This would allow everyone to gauge better the full impact of the 25% cut, he added. Asked to comment on the latest situation, the STFC told the BBC: "The STFC Review confirms the strategic priority for the UK's role in Aurora and the ExoMars mission and we expect our support for this exciting and important programme to continue. "Any change in support, such as that proposed by [the Programmatic Review], would only apply to the UK's scale of investment in instrumentation for ExoMars and not the UK's contribution to the wider Aurora programme, for which we will maintain our agreed commitment, pending the outcome of the Esa Ministerial."